The KitchenAid Gourmet Stainless Steel Measuring Cups make accurate measurement of ingredients easy. 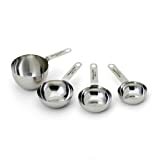 This set of 4 includes: 1/4-, 1/3-, 1/2- and 1 cup sizes. Each cup is expertly crafted from quality stainless steel. The large print measurements are easy to read. These cups fit one inside the other for nesting storage. These measuring cups are dishwasher safe for fast and easy cleanup. One year hassle-free replacement and lifetime limited warranty. One year hassle-free replacement and lifetime limited warranty. This fine product is warranted to be free from defects in material and workmanship. For one year from date of purchase, under normal use and care, KitchenAid will replace these products free of charge, if they are found to be defective in material or workmanship. In addition, from year two through the life of the products, any piece found to be defective under conditions of normal use and care will be repaired at no charge or replaced with the same item or an item of equal or better value. For more information call the KitchenAid Customer Satisfaction Center toll-free at 1-800-541-6390 or visit our web site at www.KitchenAid.com.